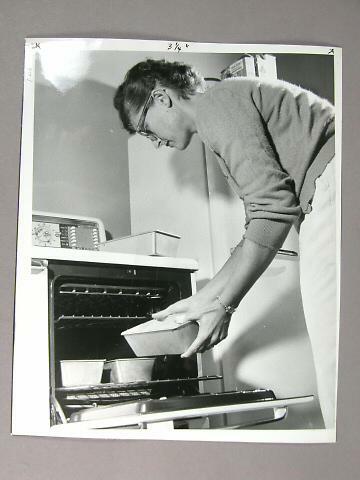 A woman, wearing a cardigan type sweater eyeglasses, and a wrist watch, is placing the third of three baking dishes into an oven. She is, accoridng to the notation onthe back of the photo, "Mrs. Delia Herbiy[g?] baking bread." three bvreakfast cereal boxes are on a shelf over her head at upper right. the box closest to her reads "$100,000.00 sweepstake[?]"